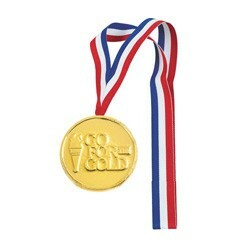 Custom Chocolate Gold Medallion Award. Every achievement, no matter how small, deserves a chocolate award. We offer a collection of sweet rewards for a job well done. Choose from our selection of awards to personalize and mark that special event. Gold Foil and Ribbon included. Pictured with stock design. Choose Milk or Dark Chocolate. The imprint area on the Olympic Style Medallion is 2 3/4" in diameter.